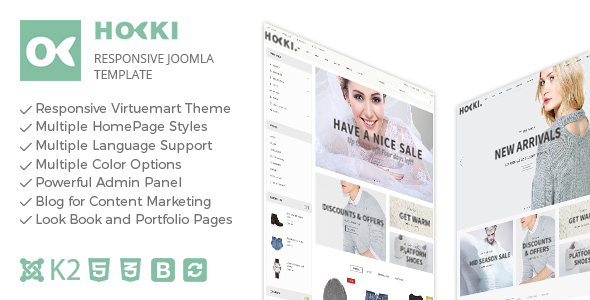 Hoki – Responsive Joomla Virtuemart Template Created by dasinfomedia. This templates have specific characteristics, namely: Hoki has features such as High Resolution: No, Compatible Browsers: IE10, IE11, Firefox, Safari, Opera, Chrome, Edge, Compatible With: VirtueMart 3.0.x, Software Version: Joomla 3.5.x, Joomla 3.4.x, Joomla 3.3.x, Joomla 3.2.x, Joomla 3.1.x, Joomla 3.0.3, Columns: 3 . You can use this Hoki – Responsive Joomla Virtuemart Template on Cms themes category for clean and minimal design, ecommerce, fashion, mobile first, mobile friendly, multipurpose, Responsive Joomla Template, three column, virtuemart theme and another uses.